Thyme is a perennial evergreen shrub beloved of Francophiles; we like it, though we don’t quite see it as a “great” herb…mais chacun a son goût. This is another of those herbs (like basil, if to a lesser extent) that comes in a myriad varieties, including species within the genus Thymus—there are over a hundred, most of which, it seems, are offered by seedsmen—plus so-called thymes not actually in the Thyme genus (“white thyme”, which is just winter savory, “basil thyme”, which is calamint, and many others). By associated flavor, one finds listed in seedsmen’s catalogues plain, French, English, Lemon, Lime, Orange, Caraway, Oregano, Coconut, and doubtless by now more “thymes”. And, like many other herbs, there is also a large trade in varieties intended solely for floral or decorative use to confuse any search. For plain thyme, while a number of seedsmen, for reasons best known to themselves, identify “English” thyme as the culinary norm, what the cook wants is French thyme (sometimes more fully “Fine Leaf French”). Buy a thyme explicitly described as “French thyme, Thymus vulgaris” from a reputable herb specialist house: that’s your best bet. (The vulgaris is sometimes rendered as vulgare.) Still, one should note that some people do prefer the “English” type; it seems to be a matter of subtlety vs power, with English thyme having a somewhat more powerful thyme taste, French a somewhat more subtle—or so they say. We’re not fully convinced that, beyond “real” thyme, even lemon thyme is necessary—else why did God make lemons? (Plus the citrusy fragrance disappears with any but the briefest cooking, or if you try to dry it.) In any event, lemon thyme (Thymus x citriodorus) comes as a dozen or more cultivars of various color patterns, none of which can be grown from seed, and one of which, oh so very helpfully, is named “Lime”; if there is any culinary difference between cultivars, we did not find information on it. But beware plants labelled “lemon thyme” that lack a distinct citrus smell, for there are many wrongly labelled types (described by plant color, not culinary quality) about. 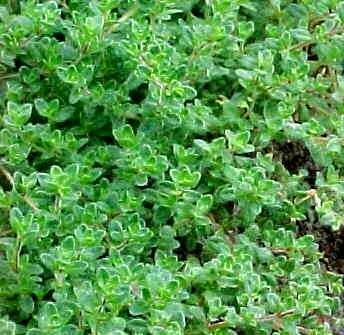 If buying any “lemon thyme”, do be sure that, whatever the name, it’s truly a Thymus x citriodorus. Like almost all herbs of Mediterranean origin, thyme likes mediocre but slightly alkaline and very well-drained soil, and lots of sun. It is a perennial, but best replaced every few years (one source says every 4 years). It can be grown from seed, but normally one buys it as a plant from a reliable specialist. Thyme takes well to indoor growing, and can be grown in a rather small and shallow container, ideally—as with all herbs that don’t like wet feet, which is most herbs—an unglazed terra cotta pot (which can “sweat out” excesss moisture) with a fair bit of gravel at the bottom. Use a potting mixture that is not peat-based. Thymes need horizontal space more than they do vertical, so a shallow, wide container is best for them. One expert recommended putting a thin layer of light gravel on the soil surface to reduce evaporation in dry weather, to give better drainage in humid situations, and to just look nice; that is probably good advice with most potted herbs. Thymes, once established, are drought-tolerant, but very, very much dislike damp conditions, which can quickly kill the plant, so keep thyme watered regularly but with a light hand; don’t let its soil get really damp. Though most herbs give best flavor in less-than-ideal soil, those being grown in pots do need a touch of fertlilization once in a while—say annually. Use a “complete” (that is, with “minor” nutrients included) slow-release type—organic if you prefer; dib a few small holes in the soil maybe a couple of inches deep and add the fertilizer, then fill in the holes. Plants should be pruned regularly, with spring usually being the best time, though some further light pruning at other times of the year is probably a good idea too; in general, try to achieve dense but open foliage that will encourage good air circulation through the leaves. Thyme can be vegetatively propagated with fair ease, and taking and starting cuttings every couple of years is a good way to keep your thyme supply vigorous. Thyme is a strong flavoring, and—as with sage—the cook not well experienced with it is advised to use it with a distinctly light hand till confidence is gained. It was last modified on Tuesday, 5 February 2019, at 02:27 EST.